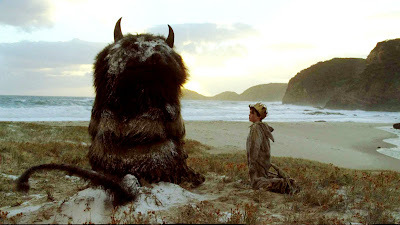 Where The Wild Things Are, a gorgeous little film about a lonely, angry little boy played by Max Records befriending lonely, big monsters, isn't so much for children as it is about one particular child. The Wild Things themselves feel completely alive; they're a triumph of practical effects, CGI, and voice acting by James Gandolfini, Lauren Ambrose, Forrest Whitaker, Chris Cooper, Paul Dano, and Catherine O'Hara. All of the characters, human and Wild Thing, struggle mightily with issues of loneliness, abandonment, rage, longing for acceptance, and the questions of what is right and wrong. To the credit of director Spike Jonze and his co-writer Dave Eggers, these issues are not spelled out blatantly nor wrapped up and solved for the audience. Though Max enters a fantasy world of escape, the movie is light on whimsy. There are unexpected moments of real fear and real uncertainty, along with a genuinely troubling event that take place between Max and his mother, played by Catherine Keener. These are balanced by some beautiful, vibrant sequences set to the music by Karen O (of the Yeah Yeah Yeahs) and the Kids. The story itself, expanded from Maurice Sendak's beloved children's picture book that contains just nine sentences, feels unwieldy and incomplete. Max's adventures with the Wild Things, who reflect aspects of himself, his family, and what's missing in his life he can't quite articulate, don't feel like it reaches a conclusion as much as it just stops. But to honor the farewell request of one of the Wild Things, I'm happy to overlook the flaws and say good things about them.